•	Recreational opportunities for millions of visitors. Although it is the second largest dam on the Colorado River, behind Hoover Dam in Nevada, its reservoir, Lake Powell, is 186 miles long and has almost 2 ,000 miles of shoreline. In comparison, Hoover’s, Lake Mead, is 110 miles long and has only 550 miles of shoreline. 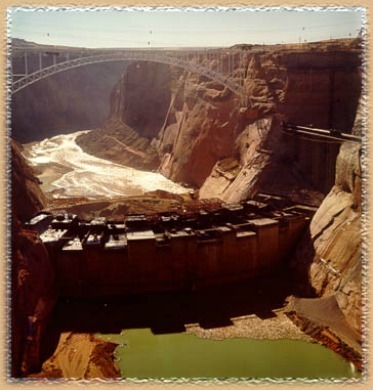 •	Glen Canyon Dam officially opened: 1966. For those of you who are interested only in the quick facts and really don’t care about the history and construction of the dam, this would be a good stopping point. You may, however, find interesting the controversy surrounding the dam, and, if so, please see my page on Glen Canyon Dam Controversy. Also, I think you will enjoy reading about the Carl Hayden Visitor Center which sits high atop the dam like the captain’s cabin aboard a modern ocean liner. If so, please Click Here. The arid southwest, as the name implies, is a dry land with little annual rainfall. Water has always been a valuable but scarce commodity, one over which feuds have been waged and lawsuits filed. For many years, the Colorado River, and her many tributaries, have been an important source of water for this dry and thirsty country. In the late 19th century and early 20th century, as more and more people moved to the west and southwest, the demand for water increased. However, there was only so much water available. 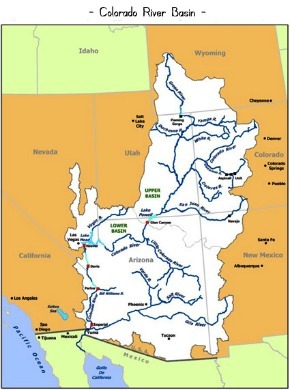 As a result, all of the states through which the Colorado River flowed fought for the right to take water from the river. In 1922, representatives from Arizona, California, Colorado, Nevada, New Mexico, Utah and Wyoming met at Bishop’s Lodge near Santa Fe, New Mexico and signed the Colorado River Compact. It allocated the amount of water each state was allowed to take from the river. Congress ratified this Compact the same year. However, one of the problems with this compact was the fact that rainfall and snow melt vary from year to year. Thus, it was not always possible to retain enough water to meet the needs of the states in the upper basin and, at the same time, to deliver the specified amount of water to the lower basin. Canyon Dam may be purchased at the Carl Hayden Visitor Center, or you may purchase them through Amazon.com by clicking the link below. Not only would they provide the means by which to store water but they would provide clean hydroelectric power, recreational opportunities in the reservoirs behind them and prevent floods. In 1950, the Bureau of Reclamation presented to Congress a plan to build a number of dams. Echo Park and Split Mountain Gorge are both located within the Dinosaur National Monument, and when word got out that Reclamation wanted to build two dams within the monument a fire storm of protest was ignited. It is well known and well documented that David Brower, Director of the Sierra Club, and Olas J. Murie and Howard Zahniser of the Wilderness Society waged a nationwide protest to the building of these dams. To see a 3 minute video about the fight to save Echo Canyon in Dinosaur National Park, please Click Here. This will open a page in Richard's Scrapbook. Once there, click the video to begin. However, there were others who fought just as hard and just as long. One of these was Dr. Harold Bradley, a retired chemistry professor from the University of Wisconsin-Madison. In 1952 he and his family spent a week rafting the Yampa River in Colorado. They took photographs and recorded their trip with a movie camera which they began showing to various groups and organizations in opposition to the Echo Park Dam. He encouraged the Garden Club of America to mail leaflets to members urging them to write their congressmen about it. Other organizations like the General Federation of Women's Clubs and the National Wildlife Federation became involved in this campaign. Alfred A. Knopf, a New York City publisher, rafted the Yampa River and was so impressed that he commissioned a book of essays and photographs. The result was: This Is Dinosaur: Echo Park Country And It’s Magic Rivers, edited by Wallace Stegner with photographs by Philip Hyde and Martin Litton. Requests for Proposal (RFP) quickly went out for the construction of Glen Canyon Dam. It was such a daunting job that only three companies responded to the RFP. The construction firm of Merritt-Chapman Scott was the low bidder at just under 108-million dollars, a bid that was even lower than Reclamation anticipated. Lem F. Wylie was appointed chief construction engineer for the Bureau of Reclamation and he faced a monumental task. •	Bring in doctors, pharmacies, clothing stores, grocery stores, banks, post office, etc. 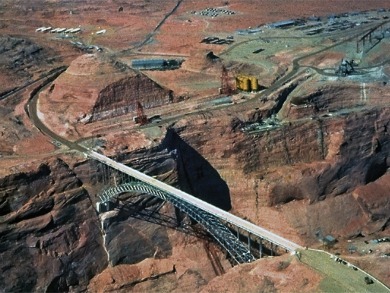 Reclamation initially had planned to use Kanab, Utah as their base as it was the nearest town of any size with an infrastructure to support a construction crew. Initially, the construction workers on the dam lived in trailers on the west side of the river. In order to get workers from the west side to the east side, a seven foot wide footbridge was built across the 1280 foot span from tower to tower. 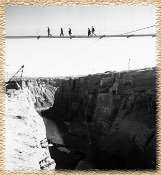 The footbridge consisted of a wire mesh deck laid on cables stretched across the canyon. It was built in 60 days and, at the time, was the longest footbridge in the United States. In the meantime, work was going on by the Kiewit-Judson Pacific Murphy Company in California of building a permanent steel arch bridge. Once it had been constructed, it was to be disassembled, and the sections were to be trucked to the site, half on the east side and half on the west side. In early May of 1957 the work began of placing and joining the sections on the east side. In late May they began working on the west side, extending the bridge section by section. The bridge was completed on August 11, 1957 and at 1,271 feet long and 700 feet above the river was the highest bridge of its kind in the United States. It was dedicated on February 20, 1959. 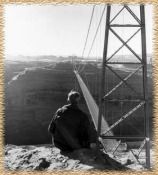 Now that a bridge had been built across the Colorado River, and there was a continuous road linking Flagstaff, Arizona and Kanab, Utah, it was time to concentrate on a place for the dam workers to live. On March 22, 1957 the Bureau of Reclamation exchanged a piece of land in southeastern Utah, known as McCracken Mesa, for 24.3 acres of land located just a few miles southwest of the dam site. This land was owned by the Navajo Nation and was occupied by the Manson Yazzie family under the Navajo Tribal grazing program and was known as Manson Mesa. As it turned out, this was one of the few times when the Native Americans got the better of the white man: McCracken Mesa is now part of the rich Aneth Oil Fields. The Bureau began to lay out the streets for the town and brought in trailers to house the workers and temporary metal structures for schools, laundromats, businesses and professional offices. Babbit Brother’s Trading Post was the first grocery store and the largest metal building in this new government camp. 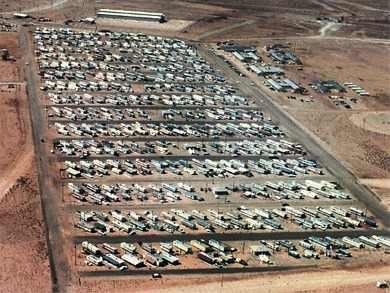 Government Camp was later named Page after John C. Page, who served as Commissioner of the Bureau of Reclamation from 1937-1943 and was an advocate of reclamation projects in the western United States. Page was a federal municipality until March 1, 1975 when it became incorporated. Before any work could be done on the dam itself, it was necessary to divert the flow of the Colorado River. This was to be done by building two tunnels, one on each side of the river. Each tunnel was to be 2,700 feet long and 41 feet in diameter. The tunnel on the right would be used to handle the normal flow of the water around the dam site, and the one on the left, 33 feet above the water, would be kept in reserve to be used, along with the right tunnel, to handle floods. On October 15, 1956, six months after Congress authorized the dam, President Dwight D. Eisenhower, from the Whitehouse in Washington, DC, depressed a telegraph key that ignited the first explosion at the dam site displacing large amounts of sandstone rock from above the right diversion tunnel. 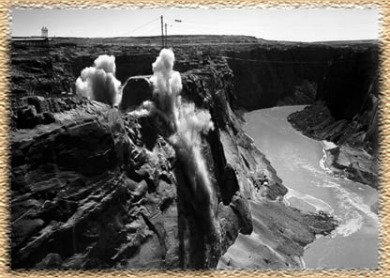 With this explosion, construction of the second largest dam on the Colorado River had begun, but, as momentous as it was, this was only the first of many such explosions. The sandstone rock that formed the canyon wall was, by its very nature, subject to flaking and giving way to gravity. During the excavation of the tunnels and the widening of the dam site, the rock would often flake off in huge slabs and come crashing down. To stabilize the rock, hundreds of holes, up to 72 feet deep, were drilled into the walls and ceilings and long metal bolts with expansion anchors were inserted. Concrete was then forced into the area around the bolts, thus securing them to the wall. As the tunnels grew in length, width and depth all of the material that had been excavated had to go somewhere. That somewhere was into cofferdams built ahead of the dam site to hold back the Colorado River, then once the tunnels were completed, to divert the water into the right diversion tunnel. On February 11, 1959, a little over two years from the initial blast, the Colorado River was released and began flowing into the right diversion tunnel. Three months later, the left diversion tunnel was completed. A concrete mixing plant was built near the dam site. It was a huge structure, over 217 feet, equivalent to a 20-story building, and mixed the material for the concrete at the rate of 1,450 tons an hour. “When concrete is used in massive structures, such as dams, foundations, and some concrete highways, it must be cooled to minimize cracking. Refrigeration is required to offset the heat of hydration of cement after pouring. The concrete mixture coming out of the batch plant before refrigeration was about 95 degrees Fahrenheit. Per specifications, it had to be 50 degrees Fahrenheit. Therefore, the temperature had to be reduced 45 degrees. These four processes actually reduced the mixture to 47 degrees, 3 degrees below the required 50 degrees, but it provided insurance that the mixture would be 50 degrees by the time it was poured into the forms. Additional cooling of the concrete after it was placed was accomplished by circulating cold water through 1” aluminum pipes embedded in the base of each form. This was done in two stages. In the first stage the water was chilled from 38 to 47 degrees for a period of 12 days. The second stage called for the water to be chilled to 38 degrees. Water was later switched to brine which was chilled from 35 to 28 degrees in the final stages. This second stage was for a period of 52 days. In order to deliver the cement from the batch/mixing plant to the concrete forms of the dam two 50-ton-capacity mobile cableway systems had to be designed and erected. It called for two mobile towers on each side of the canyon. 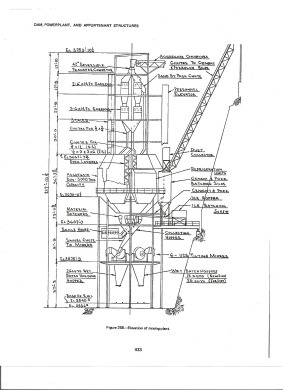 Each of the towers was set on four 8-wheeled trucks, one under each leg of the tower. The trucks ran on tracks of 150-pound rails. On the west side of the canyon, the high tower was 180’ tall and the lower tower was 125’ tall. Both towers had a lateral movement of 910’. Due to a difference in elevations of the two canyon sides, the high tower on the east side of the canyon was 130’ and the lower tower was 85’ high. Both towers had a lateral movement of 810’. The towers on the west side were referred to as head towers and the ones on the east side were referred to as tail towers. The total span of the high tower was 2,050’ and the span of the low tower was 1,800’. The 4-inch cables between the east and west towers were the largest ever used in dam construction. Approximately every nine to ten months, these cables had to be replaced due wear and tear. The first thing that had to be built was the dam’s foundation. This was done by digging down 137’ to bedrock. 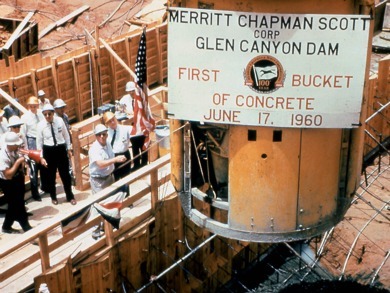 On June 17, 1960, Secretary of the Interior, Fred A. Seaton, in a ceremony attended by various dignitaries, including the governors of Arizona, Colorado and Utah, pulled a cable dumping the first 12-cubic bucket of cement into the forms. After the concrete blocks were cured, the wooden scaffolding was removed and moved up to the next tier. As the work progressed and the dam grew higher, the wooden forms were replaced by steel forms. Glen Canyon Dam emerged from bedrock incrementally, as a series of blocks seven and a half feet high until it reached a full height of 710 feet. Work on constructing the dam continued 24 hours a day until on September 13, 1963, the last of over 400,000 buckets of concrete was placed. The dam itself was completed in 1963 and over the next three years the generators and turbines were installed. 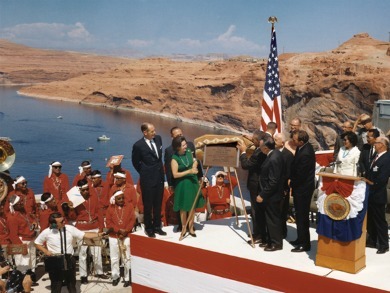 On September 22, 1966, Lady Bird Johnson dedicated Glen Canyon Dam. This has been a very brief synopsis of Glen Canyon Dam, although some may argue that I have gone into more detail than really necessary. I would be remiss, however, if I failed to bring your attention to the controversy that has been so much a part of its history, even before President Dwight Eisenhower ignited the first charge in 1956. Unfortunately, over 50 years later, the controversy still wages. 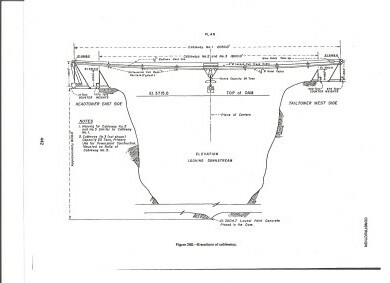 For anyone truly interested in the construction of Glen Canyon Dam, I highly recommend Technical Record of Design and Construction, Glen Canyon Dam and Powerplant prepared by the Bureau of Reclamation. Even before construction on Glen Canyon Dam began, it was steeped in controversy. There were many opponents who felt the dam should not be built and their passions ran deep. They pointed to the pristine wilderness of Glen Canyon and bemoaned the loss of such magical places as Music Temple, Cathedral in the Desert and Outlaw Cave. But, just as passionate were those proponents who felt that building the dam more than justified these losses. They talked about hydroelectric power, taming the Colorado River and providing much needed water to thirsty lands. And, now that the dam has been built, and each side has seen their predictions come true, there is talk about draining the lake and returning it to its natural state. My question to you is: Should Lake Powell be drained? I would like more than just Yes or No. maybe some personal experience that has shaped your conviction, pro or con. Also, I would love to see and share your photos. Enter the subject of your comment. I like to type my pages in Word and then copy and paste. I find it easier this way. prepared by the Bureau of Reclamation.